Classic always looks good – this is kinda fashion law. And what belongs to classic? Yes, Chanel – and here I mean more vintage fashion, than the current one – since Gabrielle Chanel till 90s (can we call 90s vintage?). So what should you wear that looks like Chanel? I picked some photos from the 90s for you to show you what I mean. What could be more classic than this? In any combinations, b&w is an eternal must wear of girls with a good taste. Beige is a quite good alternative to white. 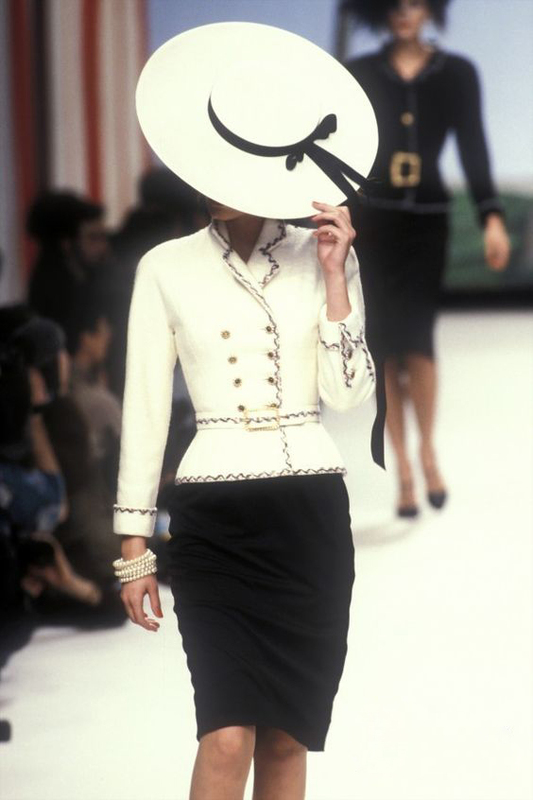 In the 90s Karl Lagerfeld used camellia pretty often in his outfits. The picture of this flower is now connected in peoples mind with Chanel. So everywhere you find something that looks like camellia – think of my post:) A few years ago Marni put a beautiful necklace to the market with some fabric camelias. The necklace was sold out very quickly. Below is my example of Chanel Style… Combined with the simple shoes and accessoires. So one more tip – if you use some of the Chanel Style elements – make it a classic look, not a fashion outfit. Keep it simple.